Welcome to the Strictly Vanilla server group! 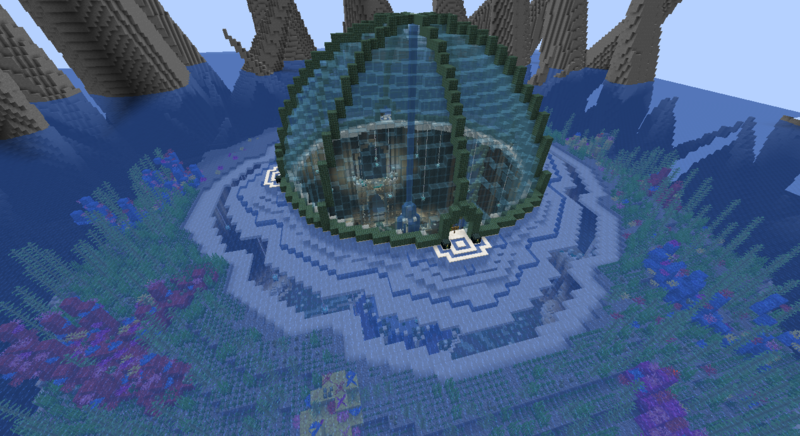 This is our Survival spawn for the 1.13 Update Aquatic*. incorrectly you will be sent back to the beginning. answers to the quiz questions can be found or gleaned from what is in the INFO BOOK in game, or on our Rules Page. and Safety Deposit Room for safe access of shulkers at spawn. back to spawn . The command for porting to spawn is /trigger Port set 1, and it costs 5 vf. can go through the end and when you exit the end it takes you to your bed. we have some larger currencies that are useful for trading (or for compact Echest fish storage). other player right click the cancel sign. on the signs in the room. 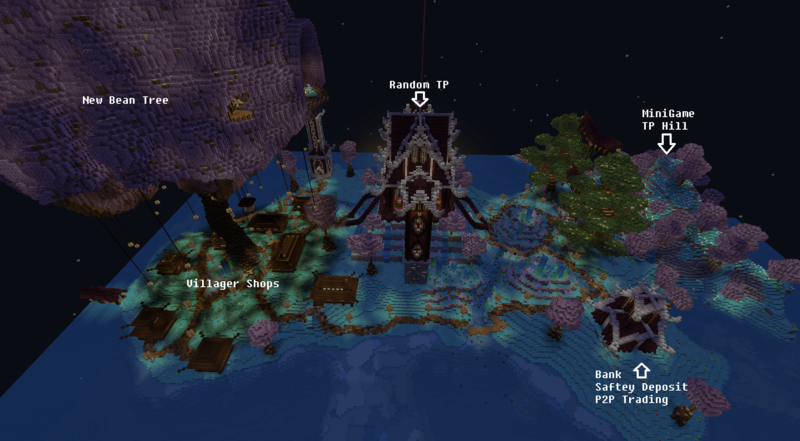 Spawn changes every so often, so be sure to take a look around to see what’s changed whenever you come to visit. vanilla gameplay logic applies – punch a tree, build a house, mine some diamonds. secret or secure base, you might want to pick a different spot for it. 5 seconds of slowfall to make it down safely. unable to interact with objects, break blocks, or PvP. re-enter spawn your game mode updates again back into Adventure mode. you are a new player. spawn’s protection. If you damage a player with a gray name, you will receive warnings. time here more enjoyable, so we appreciate everyone who supports the community by voting. a 12-sided die. If someone rolls 12, everyone online gets 5 bonus vote fish deposited into their bank! that’s a total of 36 vf per day. break down larger currencies into fish to deposit into your bank. /trigger GetInfo set 1 - Will display in chat, the link for this page. /trigger GetInfo set 2 - Will display in chat, the link for the Discord server. /trigger GetInfo set 3 - Will display in chat, the link for the Report Players thread. /trigger GetInfo set 4 - Will display in chat, the links for the vote sites. /trigger Port set 1 - Will teleport you to the center of spawn. /trigger stat set 1 - Will display in chat, the total amount of vote fish you have in the bank (for your eyes only). /trigger stat set 2 - Will display in chat, the total times you have voted for the server (for your eyes only). /trigger DelHome set 1 - Will delete your current SetHome. /trigger Home set 1 - Will teleport you to, your current SetHome. /trigger Market set 1 - Will teleport you to, the Market Place. /trigger Teleport set - Will request a TPA to the player with that number. /trigger koth set 1 - Will teleport you to, the King of the Hill minigame. /trigger payAmount set - Will set your pay amount to that number sky credits. /trigger pay set - Will pay the player with that number the amount of sky credits pay amount is set to. /trigger stat set 1 - Will display in chat, your sky credit total. pay that player the amount payAmount is set to. If there is any information you would like to see added to this shoot me a message, Thank you. 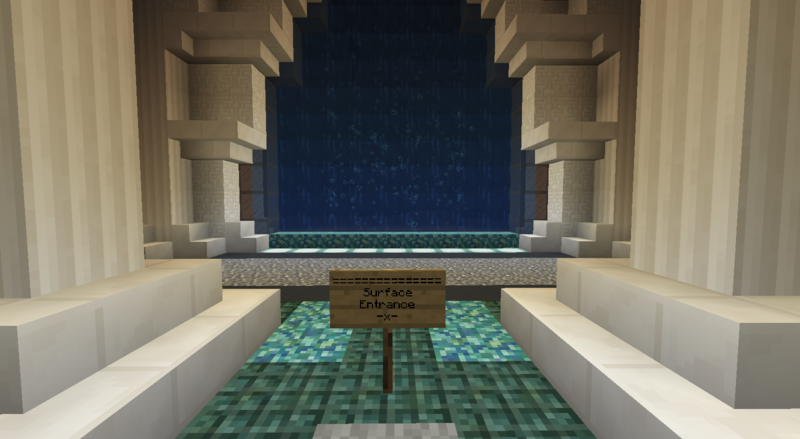 Information below is from the 1.12 server spawn and was kept for historical purposes. things. This screen shot was taken facing west. On the Southern shore of spawn is the large New Bean tree, this is where all new players begin. Under the New Bean tree are houses that have villagers in them, who offer custom trades. Suspended from the New Bean tree is the Jail, this is where we send hackers. 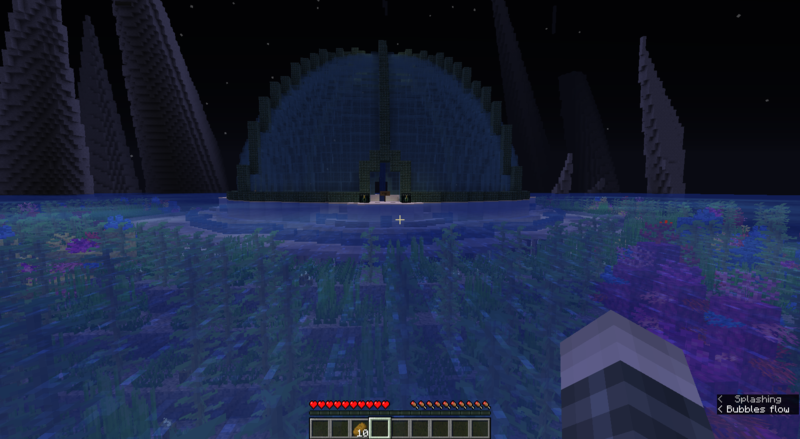 In the Center of spawn is a large castle, this structure has random teleports for each cardinal direction. or break down larger ones into fish, you can also withdrawal and deposit vote fish. of these rooms see below. On the Northern shore is the Mini Game Hill with teleporters to different minigames. rooms, if at the end of the quiz any of the three questions were answered incorrectly they will be sent back to the beginning. mode updates again back to adventure mode. is up to you, for anyone unaware of this you can go through the end and when you exit the end it takes you to your bed. if you do not agree with the items offered by the other player right click the cancel sign. fish from rolling 12's that totals 36 fish per day. the shop keepers want for the items they sell. You can also break down larger currencies into fish to deposit into your bank. Many players on the server build/repair/contribute to public farms, these farms are typically just outside of spawns protection. a good place to grab some food if you are a new player. 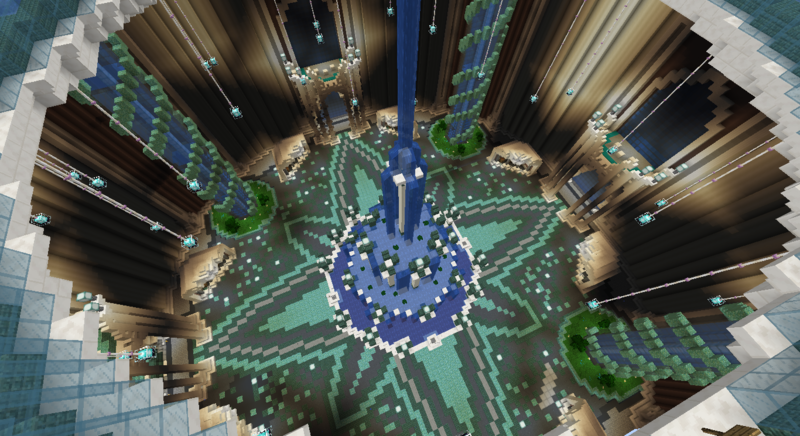 The rest of spawn is full of beautiful buildings and secrets to find so have fun exploring! 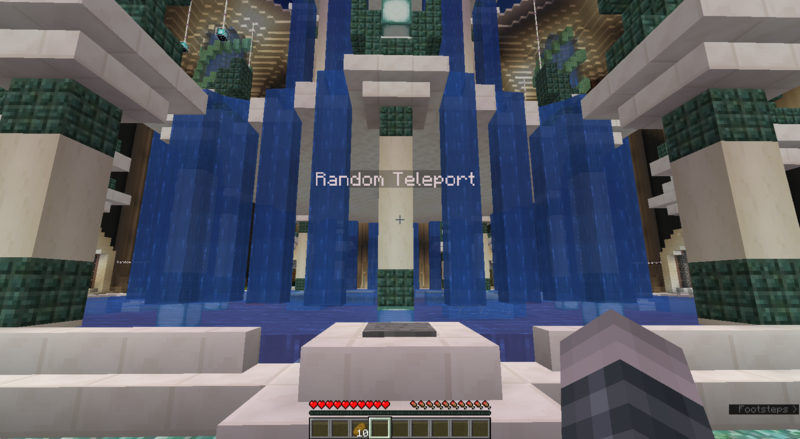 /trigger Port set 1 - Will teleport you to, the center of spawn. /trigger stat set 1 - Will display in chat, the total amount of vote fish you have in the bank. /trigger stat set 2 - Will display in chat, the total times you have voted for the server. To pay a player sky credits, you must use two triggers. First set the amount with "/trigger payAmount set [amount]". Next, get the id of the player you would like to pay. The ids are displayed next to their name in the tab player list. Lastly, do "/trigger pay set [id]" and it will pay that player the amount payAmount is set to.